There is a widely held concern that psychostimulants when used to treat ADHD can induce or exacerbate anxiety. This belief has led many clinicians to hesitate about using stimulants in patients who already suffer from high level of anxiety, prompting some prescribers to try, as first-line agents, nonstimulant medications that supposedly have less risk but may be less effective against core ADHD symptoms. The actual data about stimulants and anxiety, are more mixed. Recently, a meta-analysis was published with the hopes of coming to a more definitive answer on this questions. The study reviewed 23 different placebo-controlled trails and encompassed nearly 3000 children and adolescents. Clinician rated side effect measures of anxiety, when available, was utilized to assess patient anxiety. Subgroup analyses and meta-regression techniques were carried out to examine differences between medication types and doses. In terms of results, there was overall a decreased risk of anxiety in patients treated with stimulants versus controls. This global finding, when analyzed more closely, held particularly with methylphenidate preparations (e.g. Ritalin, Concerta, etc) while amphetamine derivatives (e.g. Adderall) did not separate statistically from placebo. There was also some indication that short versus long-acting stimulants and higher versus lower doses were associated with this reduced anxiety risk. No evidence of publication bias was found, although a number of stimulant trials did not meet the authors’ inclusion criteria. The authors concluded that, contrary to conventional wisdom and some FDA labelling, the risk of anxiety is actually lower compared to placebo in patients treated with stimulant medications. In the Discussion section, the authors commented about the possible mechanism of their main finding and hypothesized that the reduced anxiety risk was likely not a direct antianxiety effect of the stimulant rather an indirect effect of improving ADHD symptoms. 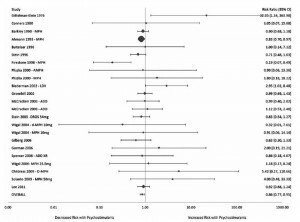 While the study certainly doesn’t exclude the possibility of some patients experiencing worsening anxiety with stimulant treatment, the article should be somewhat reassuring to those who might otherwise be reluctant to prescribe stimulants to the large number of youth with ADHD who also experience significant anxiety. Coughlin CG, Cohen SC, et al. 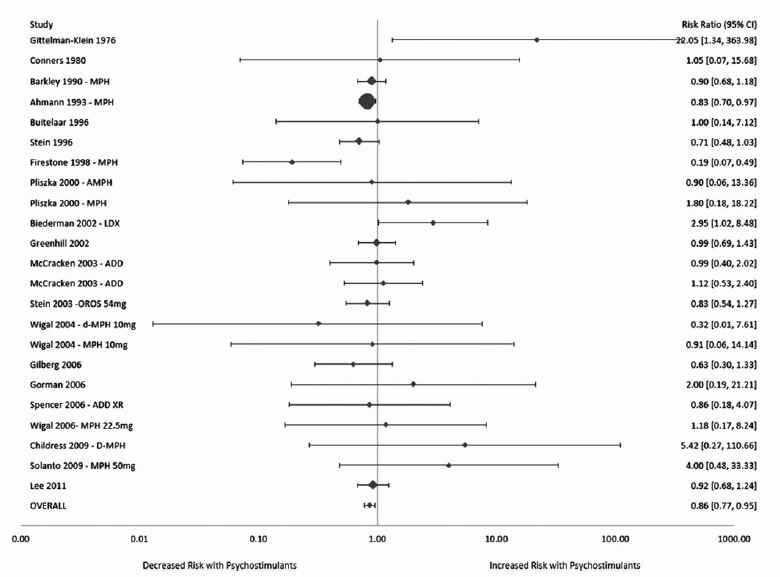 Meta-Analysis: Reduced Risk of Anxiety with Psychostimulant Treatment in Children with Attention-Deficit/Hyperactivity Disorder. J Chi Adolesc Psychopharm. 2015;25:611-617. This entry was posted on Wednesday, November 4th, 2015 at 2:38 pm and is filed under ADHD, Anxiety, Medications. You can follow any responses to this entry through the RSS 2.0 feed. You can leave a response, or trackback from your own site.